In front of you is a mill building.. In back of you is a ravine. Centuries ago Mohegans living in the area would bring their dead by canoe to a calm place on the river on the far side of the mill building. They brought their deceased loved ones here for burial in The Royal Mohegan Burial Ground that was found at the top of the ravine. This burial ground stretched to the left and to the right and covered at least sixteen acres. To get the bodies up to the top of the ledge, they would carry them up a dirt and rock incline in a ravine similar to the one behind you. 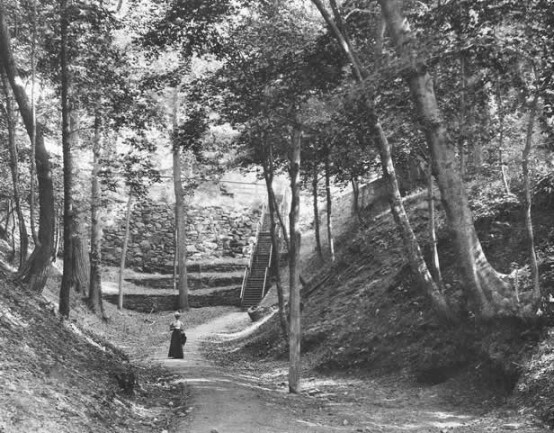 Because many streets and roads are built on old pathways, this could be the reason that the staircase was built here in the first place. Mill workers walking to work would have used the quickest way. Their constant use of the ancient incline probably added to the deterioration of it, and encouraged the building of the concrete stairs. Connecticut route 32, for example was a Native pathway that lead from the shore (New London) to Mohegan (Norwich) and beyond. The Yantic River was an important source of power for Norwich’s early industry. John Elderkin built the first gristmill at the Falls in the 1660s. During the colonial period, small mills were established to process local agricultural and forest products such as corn, flaxseed, and lumber. By the 1760s, heavy British taxes on imported manufactured products led to efforts to make these goods locally. Christopher Leffingwell, a prominent Norwich merchant, built the first paper mill in Connecticut above Yantic Falls in 1766. He followed this with a pottery, stocking weaving with knitting machines, and a chocolate mill. Nails, wire, and textile cards were manufactured in Norwich during the American Revolution. It was not until the 1800s that major industrial development of the river’s water power resources occurred. Papermaking continued on the Yantic until 1860. Leffingwell’s old mill was purchased in 1811 by Russell Hubbard and two other investors. Russell Hubbard also owned the local newspaper, the Norwich Courier. 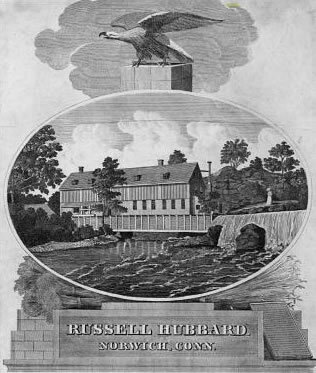 In 1818, Amos H. Hubbard, Russell’s brother, returned from the East Indies and purchased another existing paper mill. After a fire destroyed that mill, the two brothers entered into partnership to build a new stone mill below the Falls in 1837. On Russell Hubbard’s death in 1857, his brother became the sole proprietor of the paper mills. By then, the company was specializing in the production of colored end papers for books. In 1826 the Quinebaug Company was chartered for the manufacture of cotton and woolen goods. These busy and productive days continued until 1837 when many businesses failed in the financial crash and a depression hit the area. The Quinebaug Company was sold and became the Shetucket Mills. The Atlantic Carton Company and the Thames Manufacturing Company became the Falls Mills. During the War of 1812, the dearth of imported textiles and the availability of mercantile capital, encouraged the rapid growth of textile production at the Falls. The Williams Manufacturing Company began making cotton in 1813, in a converted hemp mill. Next, the Thames Manufacturing Company was established in 1823 to produce cotton. The Norwich & New York Manufacturing Company was chartered in 1829, and purchased the mill of the Thames Manufacturing Co. Out of the great financial crash of 1837, the Norwich Falls Company emerged as the sole cotton manufacturer at the Falls, taking over the assets of earlier efforts. By 1860, the Falls Company took over Amos Hubbard’s paper mill and became the only industry below the Falls. Above the Falls, a variety of operations continued, including the manufacture of firearms, files, bobbins, woolen goods, etc. At its site, the Falls Company grew to nearly three times its former size and power. As it grew, it purchased water rights and privileges, so that by the l860’s it was able to control nearly the entire waterpower of the Yantic River. By the 1880s, the available waterpower no longer met the needs of powering the machinery. A new mill was erected with a powerful coal-fired steam engine, still in place. The specialty of the Falls Mill was awning cloth for store fronts. The mills closed in the 1960s. These have since been converted to condominiums and apartments.